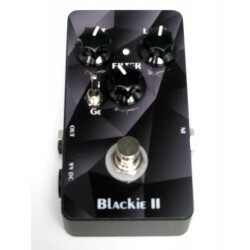 Producer of effects pedals for guitar and bass. 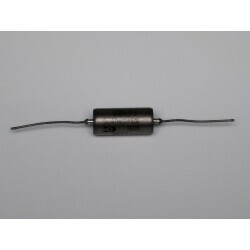 These products are designed, manufactured and assembled by hand in France. DOC MUSIC STATION search shops resellers, contact by email for conditions. 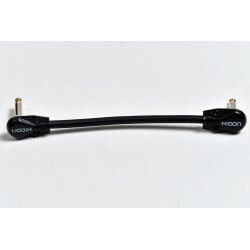 Cable high quality wired in double screening that will allow use on all scenes in the most difficult conditions. 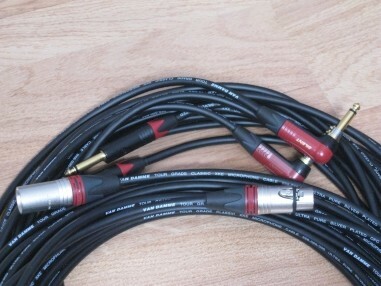 These cables will support the comparison without blushing with prestigious brands. 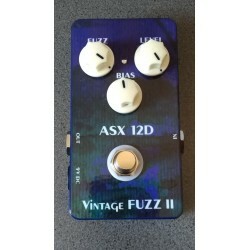 The silicium fuzz face reviewed by the Doc ... 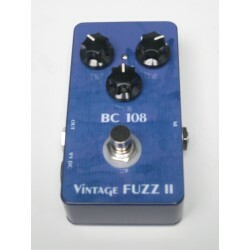 Same pattern as version 1 but in a compact format.BC108 transistors (sorted), the modern version of the Fuzz Face. 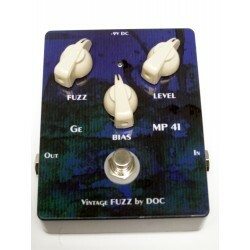 The fuzz face reviewed by the Doc ... 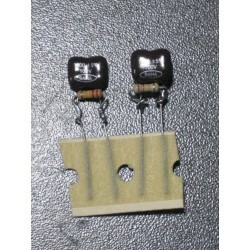 Same pattern as version 1 but in a compact format.NOS germanium transistors NKT275 (sorted transistors). 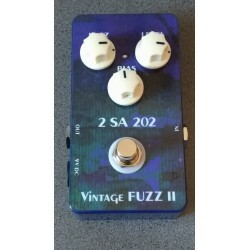 Limited series given the scarcity of transistors. 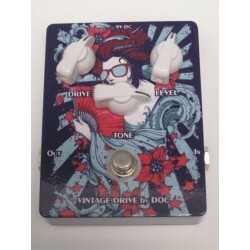 Guitar overdrive / distortion 100% transistors jfet (as transistors between the input and the output of the sound), any integrated circuit in the audio circuit. 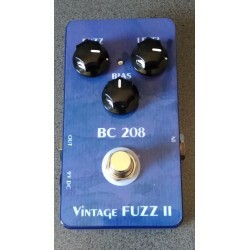 The silicium fuzz face reviewed by the Doc ... NOS BC208 gold pins transistors (sorted) in ceramic case TO-106, the modern version of the Fuzz Face. 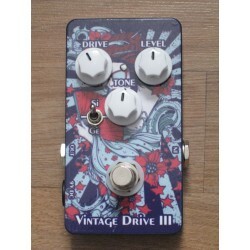 Guitar overdrive 100% transistors jfet with internal voltage doubler circuit, any integrated circuit in the audio circuit. The legendary sound of the 4558 review by the DOC. 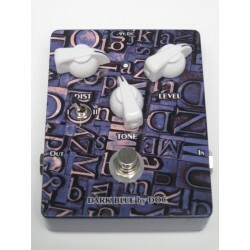 Tubecreamer guitar overdrive pedal based on a TI 4558 with a switchable symmetrical clipping circuit between silicon / germanium / led. 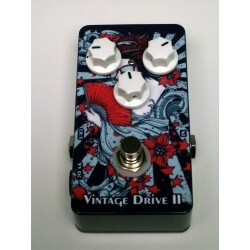 The most versatile overdrive from boost to big overdrive. 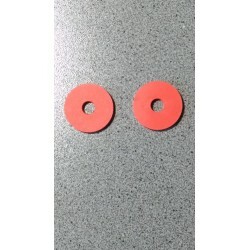 Set of 2 red rubber strap locks. 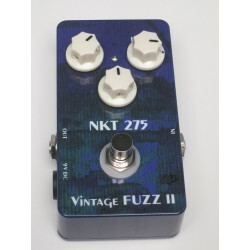 Guitar distortion pedal based on a JFET OP amp TL072.Two distortion modes: symmetric and asymmetric which will take you to the metal doors. The legendary sound of the 4558 review by the DOC. 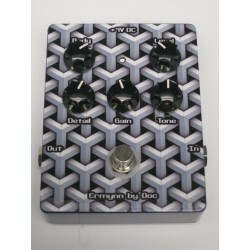 Same pattern as version 1 but in a compact format.Overdrive pedal tube screamer type of guitar based on TI 4558 with a symmetrical clipping circuit silicon (sound close to a TS 808). 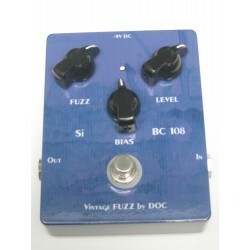 The Fuzz Face Silicon reviewed by the Doc ...BC108 transistors (sorted), the modern version of the Fuzz Face. The legendary sound of the 4558 review by the DOC.Guitar overdrive pedal based on a TI 4558 with a symmetrical clipping circuit silicon (sound close to a TS 808). The legendary sound of the 4558 JRC reviewed by the DOC.Guitar overdrive pedal based on a 4558 JRC with an asymmetrical clipping circuit composed of silicon diodes + germanium / silicon (modern tone more gain than the Vintage Drive). The Treble Bleed (or treble bypass) is an element that was created to compensate for the characteristic decrease in acute when one decreases the volume of the instrument. 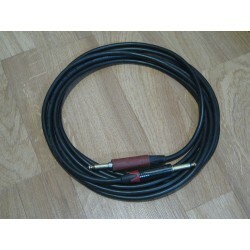 Shielded power cable that will magnify your pedalboard or your amp. 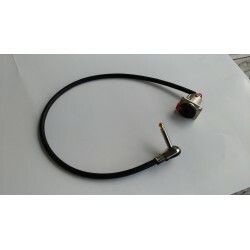 Two female connectors available: IEC plug or 6.3mm lugs. For power up to 500W. 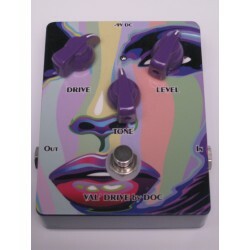 Overdrive pedal (guitar and bass) based KLON CENTAUR, by its dynamism you will not recognize your amp ... Even drawing and the same components as version 2 but in a compact format. Available in two different graphics: Child or Clown. 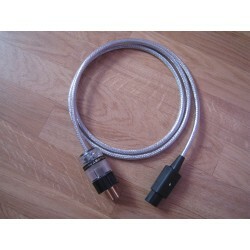 Cable high quality wired in double screening that will allow use on all scenes in the most difficult conditions. 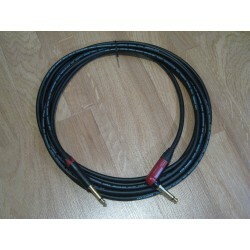 These cables will support the comparison without blushing with prestigious brands. The switch located in the instrument side jack allows a noise-free connection / disconnection. 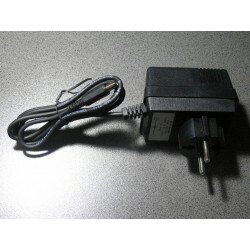 9V DC power supply compatible with all DOC MUSIC STATION pedals. 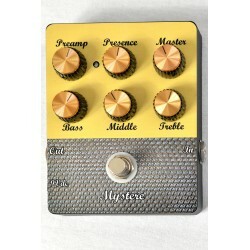 Guitar distortion based on a LM308 with two modes of distortion silicon / germanium selectable switch. JFet Booster output for the lamp typed. MARSHALL JCM800 master lead monocanal style preamp. 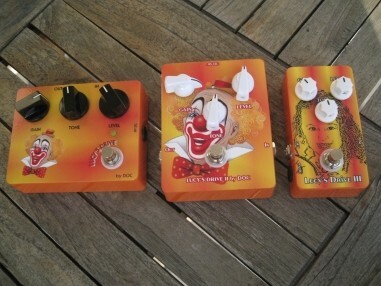 The components used for the pedals are all dedicated to audio. The site uses PAYPLUG (payment module by credit card) and PAYPAL for secure payments. However, you can pay by check or bank wire. DOC MUSIC STATION is a young company born in 2010. 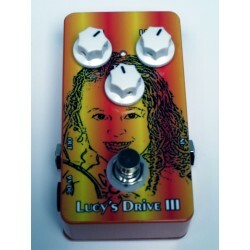 In early 2012, I was asked to make a clone of the Klon Centaur born ... and the LUCY'S DRIVE, receiving a warm welcome. 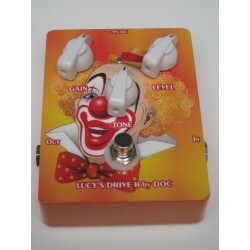 Since many other models were added to the range of DOC MUSIC STATION pedals. 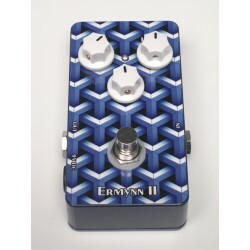 All effects are designed and handmade in FRANCE with the best components. 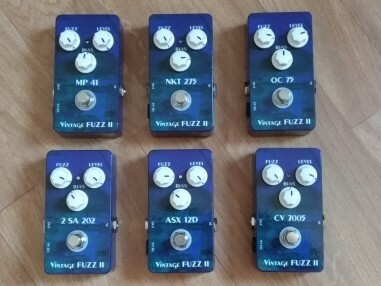 In 2015 you may have heard these pedals on many festivals throughout France, why not in your rig now?